Look over the shoulder of a professional adventure photographer as he shows you exactly how each amazing shot was captured. Do you ever look at your own photographs and wonder what that key is to take them to that next level? Where people will publish them and study them wondering how you were able to elevate the image to such a professional finish? Many of us have a solid understanding of photography and our equipment, but lack that one special ingredient. But what is it? Most of the best photographers in the world had a mentor, somebody who showed them how to grab that shot that elevates the finished product. Who let them look over their shoulder at every step of the process. And that is what this special guide will help you get. Read the thoughts of a veteran adventure photography expert as he reveals every step of the shooting process for each of 12 spectacular images – from concept through to execution and even into post-production. If you think that looking over the shoulder of a seasoned professional will help with your own photography (and who wouldn’t!?) then this is the guide you should be looking to get your hands on. So What Can You Expect From The Guide? Light Stalking guides are well known for us expecting our photographers to give away EVERYTHING and Dan’s guide does not disappoint! 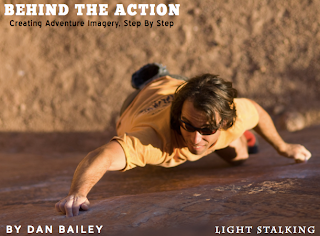 Behind The Action lays out the exact step-by-step process for 12 specific adventure and outdoor type images. Essentially, I take the reader along with me on a number of shoots and let them look over my shoulder as I scout the location, gauge the light, choose my equipment, come up with an approach, execute the final image and reflect on how it all went down. I even show you a number of outtakes so that you can follow along and see how the final shot eventually came about. In short, Behind The Action is the closest thing you’ll ever get to actually being there on the shoot with me and watching me work. Honestly, I can’t think of a better way to teach you how to become a better photographer aside from bringing you on as an assistant. Even if you have a solid understanding of photography and equipment, this book will show you the nuts and bolts of how to put it all together when you’re out there on location and the dust is flying, the light is changing and your scene is quickly unfolding. Concept: The basic idea behind the shoot & what I was hoping to achieve in a final shot. Gear: An exact inventory of what gear was taken along with me and what gear was used. Light: My assessment of the light and the challenges that each scene presented. Approach: My own unique ideas on how I planned to tackle the shoot. Execution: What ACTUALLY happened after all the planning. Final Thoughts: Reflections on what went right and what went wrong. Post Processing: Exact notations of how I adjusted the image in the digital darkroom. Quick Tips: Thoughts and advice on how to get these kinds of results for yourself. Tanzania posters for sale from FineArtAmerica.com. Choose your favourite Tanzania posters from thousands of available designs.